You have no idea how long it's taken me to make this post! This was one of the very first ideas that I had when I started out blogging.. a year and a half later, here it is. Usually I try to keep things in my bag to a minimum. I used to be one of those people who carried around literally everything with them, everywhere. Pretty soon, I got fed up with the constant shoulder ache and decided to streamline the contents of my bag. 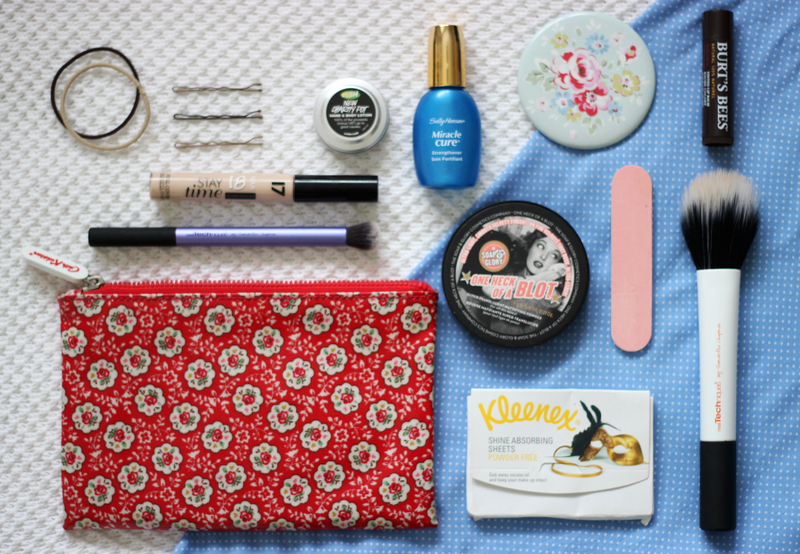 For all of my little beauty bits, I use this handy Cath Kidston zip pouch. I also have a much lighter coloured floral one, (which I much prefer), but sadly I spilt coffee all over it at some stage, so it's not looking its best anymore! These little pouches retail for just £6, and are so useful. I've had my two for a solid 3 years, and they're sill holding up really well! They can also fit a surprising amount of stuff inside, as you can see. They make it so easy to switch from bag to bag, just slip it in and you've got everything you need, all ready to go! I love the cath kidston prints :) I also love One Heck Of A Blot! I have chapstick and some hair ties ahaha, easy peasy. I always carry my concealer and the same RT crease brush. The Cath Kidston pouch is really nice, amazed it fits so much inside! Great post that bag is super cute! I actually don't bring any makeup with me on the go because I'm too lazy to touch up haha! makeup bag c: I heart Cath Kidson prints! I can be quite awful when it comes to carrying make up around with me as despite my love for it I rarely actually take much out of the house. I generally only ever have lip balm, my lipstick or gloss that I chose in the morning and a concealer if I'm feeling a bit conscious that day. That little bag from Cath Kidston is lovely by the way, I'm always looking for a smaller size bag to keep things in.